Health concerns about coal-fired power stations have prompted calls for air pollution monitoring in the New South Wales central west city of Lithgow, with doctors saying the scale of potential risks is unknown. A recent analysis of large international studies by Ben Ewald, a public health lecturer at the University of Newcastle, found correlations between poor air quality and premature death, low birthweight, and type two diabetes. Dr Ewald said if the findings were applied to a NSW setting, it could be drawn that fine-particle air pollution contributed to 279 premature deaths, 233 babies being born underweight, and 269 people having diabetes per year. The findings were based on ambient air quality data for NSW in 2017 from the Office of Environment and Heritage. Based on the analysis, he said there was a strong case for a review of where and how air quality was monitored, especially near coal-fired power stations such as Lithgow’s Mount Piper Power Station, which had no continuous monitoring requirements under its Environmental Protection Licence. “I’d be very keen to see air pollution measured at Lithgow because it’s a town in a valley that has a power station not far away and, potentially, the pollution might be at high levels there,” Dr Ewald said. “[At] places in the Hunter Valley — certainly Muswellbrook, Singleton — several in Newcastle and all over Sydney, there are monitoring [stations] that record how much of this fine particle pollution there is. “That can be looked up online by anyone who cares to go and search for it. Lithgow GP Richard Stiles said he had been concerned about the health implications of air pollution for locals for years. He supported the idea of air quality measurement in the city. “We know we have issues with [premature death, low birthweight, and type two diabetes] in the Lithgow region,” Dr Stiles said. 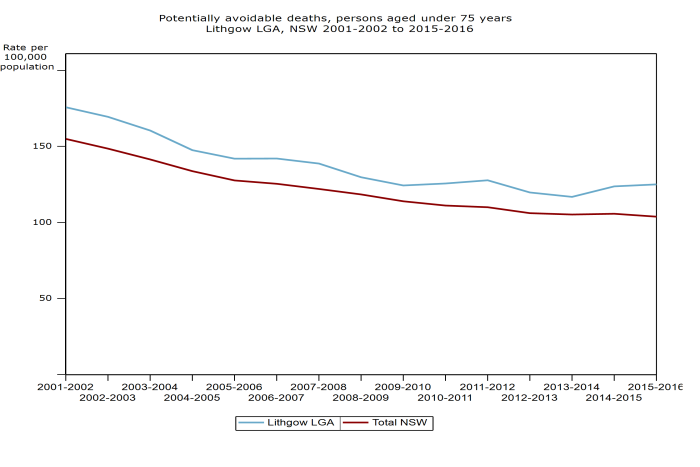 Data from NSW Health showed the Lithgow region had a higher rate of premature deaths than the state average at 125 per 100,000, compared to 104 per 100,000 in 2015-16. However, Dr Stiles said that without localised air quality monitoring, it was difficult to draw conclusions about the contribution of fine particle air pollution and health problems. He said it was important that all the tools available were employed to give local residents transparency about potential health risks. Dr Ewald said he was able to map links between health problems in the Sydney basin and the Hunter region, based on air pollution data — but not in Lithgow. “For Sydney, the air has been very well characterised, and for the upper and lower Hunter it’s been partially characterised — for the other areas there’s a bit of uncertainty,” he said. A senate inquiry last year recommended the NSW Government commission an independent assessment of the health impacts of coal-fired power stations. Dr Ewald was commissioned by Environmental Justice Australia (EJA), a legal group wanting environmental controls to limit emissions for coal-fired power stations. Dr James Whelan, a researcher for the EJA, said Dr Ewald’s findings were worrying. “We learnt that there are three pollutants of greatest concern: fine particle, sulphur dioxide, and oxides of nitrogen,” he said. Dr Ewald said many countries with coal-fired power stations used “post-combustion capture” to trap carbon dioxide from flue gases, capturing emissions before they are released into the atmosphere. “Three of the state’s power stations are having their environmental licences reviewed,” he said. The NSW power stations being reviewed are Lake Macquarie’s Eraring and Vale Point power stations, and Mount Piper in Lithgow. The Environmental Protection Authority is the agency responsible for assessing air quality monitoring at power stations around the state. The EPA recently conducted a review of measurement and reporting and found there were inconsistencies in monitoring requirements between the state’s five coal-fired power stations. “As a result of this review, the EPA is working with power stations to make emissions monitoring more consistent, improving the environmental performance of power stations, including in the Lithgow area,” a spokeswoman for the EPA said. A spokeswoman for the NSW Office of Environment and Heritage said it can access EPA-regulated industry monitoring sites and report information to the community. Meanwhile, a spokesman for the owner of Lithgow’s Mount Piper Power Station, EnergyAustralia, said it “strongly rejects” any implication the facility posed an unacceptable risk to human health. “These claims are needlessly upsetting for the community and our people at the Mount Piper Power Station, who work hard to provide an essential service to thousands of households each day and night,” he said. The spokesman said EnergyAustralia monitored ambient air quality at three locations at the decommissioned Wallerawang power station, which is anticipated to be transferred to the Mount Piper site under the current review. He added that the company performed independent stack emission tests which were recently audited by the EPA and had been passed. “We’re also in the process of installing a continuous emissions monitoring system for stack air emissions,” the EnergyAustralia spokesman said. Dr Ewald said he was confident reform that would limit potential health effects of air pollution was possible. “The important thing is, it’s a health problem that has a relatively easy fix in that pollution could be cleaned up by insisting that pollution be cleaned up by modern pollution controls at the power stations,” he said. This article is by ABC journalist Kate Cowling and was first published on ABC news.